All over at Selhurst Park and Crystal Palace have trounced Newcastle. Loud boos from the Magpies fans at the final whistle. A brilliant Crystal Palace break away, led by the brilliant winger Yannick Bolasie, which is finished by James McArthur for his second of the game. Not long left. How will Newcastle boss Steve McClaren react in the post-match interview? Left-back Pape Souare with some neat footwork before blazing over the crossbar from close range for Palace. Palace striker Patrick Bamford working hard to get the ball back, he wants to impress but where can you fit him into this team? Unfortunately, the youngster will continue to have a bit-part role to play in this side. Two minutes left for Newcastle to endure. Palace send on on-loan Chelsea striker Patrick Bamford for the excellent Connor Wickham. Palace striker Connor Wickham deserves a goal, but it doesn't look like he will be getting one today. His shot from the edge of the area ends up in north London. That's his last action of that match. "I don't like to see managers get sacked, but it is all about results. Watching this game Newcastle have been incredibly poor, there is no leadership.The back four are not working together and that leaves gaps. At the moment Palace can do what they want, it is only 4-1 but could have been a lot more than that." Newcastle defender Chancel Mbemba booked for a barge on Palace left-back Pape Souare. "Newcastle's players have been questioned publicly this week by the manager, but I have seen no evidence of desire this afternoon." Steve McClaren on the touchline trying to urge his men on, but this one is gone. Is his Newcastle career over too? Newcastle fans chanting, "You're not fit to wear the shirt" to their players. Can't argue with that. Crystal Palace midfielder Yohan Cabaye won't finish the match against his old side, as South Korean Lee Chung-yong is sent on by ex-Newcastle boss Alan Pardew. Don't know whether to laugh or cry? The Newcastle fans decide to laugh, cheering every completed pass from their players. Newcastle striker Siem de Jong, just on as a substitute, nearly gets a goal, but his strike is deflected wide. Crystal Palace may want to wake up again to avoid a nervy finish to this game. One could bring two and three for the visitors. Luuk de Jong gets his wish. Jack Colback and Georginio Wijnaldum come off for Newcastle and Siem de Jong and Yoan Gouffran go on. Not much point sending them on though. No sub has scored for either side this season. Newcastle's former loanee, and brother of current Toon player Siem, has his say. Winger Wilfried Zaha's afternoon is over for Crystal Palace and he's is not too happy to be brought off. Midfielder Mile Jedinak comes on to sit in front of the back four. Almost a fifth. Once again a Palace man is able to bring the ball forward unchallenged. This time it's full-back Joel Ward, who unleashes a rocket of a drive which Rob Elliot does brilliantly to tip over the crossbar. David in Bournemouth: To all those who say: "I bet you wish Pardew never left". No I don't, but that doesn't mean we're happy with McClaren. Steve from Surbiton: Steve McCaren has to be the most overrated coach in English football history. Nice guy, but what has he ever done as a manager in this country? You have to be judged on winning games, not because you were Alex Ferguson's sidekick! Jason Puncheon's free-kick for Palace comes to nothing. Newcastle break at the other end and left-back Paul Dummett's cross is defended strongly by Palace skipper Damien Delaney. He - like many of his team-mates - has had an impressive game. Another successful cross from a Crystal Palace wide man and this one was a beauty, shaped into the six-yard box from the left hand side but Yannick Bolasie can't keep his stretched effort on target. When do we start getting a piece ready to say Steve McClaren has been sacked as boss of Newcastle? Could well get the chop this evening. His side have been a shambles at the back. Fabricio Coloccini is wearing the captain's armband, but he couldn't lead a dog at the moment. Not only have the Palace wingers scored three of their four goals, but they're also putting in plenty of successful crosses. Newcastle, in the opening 55 minutes or so, have not succeeded with a single cross. Excellent crossing or poor Newcastle defending? Bit of both I'd say. Palace looking menacing and showing no sign of letting up, they're looking to get more goals and almost get another through Jason Puncheon, but the winger's drive flies narrowly over the crossbar. What have Newcastle got left to offer in this match? Winger Wilfried Zaha gets past Fabricio Coloccini like he's not even there and puts in a low ball which Connor Wickham can't get on the end of. "It wasn't even a great ball in from Crystal Palace, but whenever a ball is played into the Magpies' area no defender goes and challenges it for it. And Bolasie was left totally free." Palace concede a free-kick around 30 yards out as Connor Wickham is brought down. Former Newcastle man Yohan Cabaye chips the ball into the area, defender Damien Delaney nods it on and the impressive Yannick Bolasie is on hand to finish at the back post. This could get ugly for Steve McClaren's men. Newcastle get us back under way and striker Papiss Cisse almost gets on the ball inside the Palace area but can't quite make it count. At least it's another touch in the opposition penalty area. Newcastle bring on defender Jamaal Laschelles for midfielder Ayozi Perez. The Magpies switch to a back three. What will Newcastle boss Steve McClaren be saying to his men at the break? Defend better for starters, but he'll have been ramming that message home all week in training. Palace getting into the box at will - Newcastle, not so much. The yellow dots signify touches on the ball and the home side (left) have had many more in the area than the away side (right) who have had just four. Boos from the Newcastle fans at half-time. They have had a wretched half. Palace boss Alan Pardew will be very happy with his side's performance after going a goal down. Wilfried Zaha chopped down by Paul Dummett but his reputation precedes him as the referee fails to award a free-kick. Yannick Bolasie gets on the ball and his first thought is forward. He wants to put his side on the front foot each time and it's a joy to watch. His dancing footwork is mesmerising and he has given Newcastle a torrid time this afternoon. "Yet another goal conceded by Newcastle after a ball into the box. Newcastle just aren't doing the basics right and it's killing them." Newcastle just cannot cope with the pace of Yannick Bolasie. He breaks and puts through Connor Wickham on the charge. The big man skips past Chancel Mbemba before floating a ball over to Wilfried Zaha, who volleys into the ground and the ball loops into the net. Deserved. Newcastle boss Steve McClaren looks on glumly. Wilfried Zaha goes into the book for a dive. Why do that?? He has had a brilliant game so far but tries to con the referee into giving a decision. Stuart Attwell was having none of it though and right penalises the winger. Papiss Cisse ploughing a lonely furrow up top for Newcastle, trying to do a job similar to Connor Wickham but the ball is bouncing off him. Hard for the Senegal man. Yannick Bolasie running rings around Newcastle. Another David Beckham-style cross from the right, but James McArthur can't stretch enough to get his head on it and Jaryl Janmaat clears. It's not just the pace of Crystal Palace that Newcastle are having to contend with. Striker Connor Wickham is proving a handful too, using his frame to hold the ball up and bring others into play. That frontline is working a treat at the moment. When's the third coming? Newcastle looking to string some passes together but the Palace defence are holding firm. Again, they break forward with pace and Wilfried Zaha has an effort blocked inside the area. The Newcastle defenders will have nightmares tonight of the sight of Zaha, Yannick Bolasie and Jason Puncheon running at them. I got 99 problems but winning ain't one. Home side in front but a very subdued atmosphere at Selhurst Park. They've only seen two wins in seven games at home so far, so you would think they'd be in more of a joyous mood. Perhaps they know what's coming? Their side in control at the moment though. Classic Newcastle for Palace's second goal as Fabricio Coloccini fell over trying to deal with the ball and Yannick Bolasie slammed home. Can they get a quick third? The pace of Wilfried Zaha and Yannick Bolasie did for Newcastle on that goal. The pair link up once again, but the latter's cross is wayward. Palace are lightning up top, they can take advantage of this poor Newcastle defence today. Crystal Palace throw men forward and their reward, helped out by some horrible Newcastle defending, is to take the lead. A ball rolls across the penalty area - which Fabricio Coloccini falls over trying to stop - and eventually reaches Yannick Bolasie at the other end, who smashes in a low finish. That was poor from the visitors. James McArthur soon has a chance to make it a second, but balloons it high into the stand. That would have needed a deflection of epic proportions to go in. Newcastle's lead last less than three minutes. Excellent work from Crystal Palace striker Connor Wickham who holds the ball up on the edge of the box before feeding James McArthur. The midfielder's effort is on target, but takes a massive deflection off the unfortunate Paul Dummett to wrong-foot keeper Rob Elliot and roll into the net. "Cisse is just onside, just on the shoulder of Delaney. And is was very well finished." That's Papiss Cisse's second league goal of the season and the first since the opening day. Newcastle were hardly in the match at the stage, but are now threatening a second as Cisse and Moussa Sissoko both have shots blocked in the area. Poor defending from Crystal Palace on all accounts. Full-back Daryl Janmaat is able to carry the ball a long way deep in the Palace half, before clipping a ball in to Papiss Cisse. The Senegal striker runs through unmarked and glances a header in via the back post. Jason Puncheon's driven ball into the box is tipped away by Rob Elliot. The Newcastle goalkeeper made more of a meal of it than it actually deserved. Oh hello! Game spicing up here. Jack Colback brings down Wilfried Zaha and the Palace man is not happy, grabbing his opponent's leg before they square up to each other. Just handbags but both teams showing passion. Newcastle left-back Paul Dummett is set for a long afternoon. Tricky winger Wilfried Zaha already working his quick feet but the cross comes to nothing. Both teams looking to utilise their wide men, but they haven't found the pin-point ball yet. Former Sunderland front man Connor Wickham playing the lone striker role for Palace today. He would love to get on the scoresheet against the Magpies. At the other end, Moussa Sissoko flashes a cross straight across the box which goes out for a throw. Crystal Palace have made a rapid start to this game and almost force the opener. Newcastle give the ball away deep in their half and the dangerous Yannick Bolasie whips in a low cross which Fabricio Coloccini stretches to dig away. The home side get us under way at a chilly and blustery Selhurst Park. Lots of gloves on show. Cheers from the home fans but boos from the away ones as former Newcastle player Yohan Cabaye's name is read out on the Tannoy. Kick-off imminent. "Sunderland showed Newcastle how to nullify Crystal Palace at home, negating their pace out wide and shackling Jason Puncheon. Above all, Sam Allardyce had them very disciplined. "I can't see a repeat. Injuries might mean a Toon central midfield of Anita and Gouffran. Poor together at Manchester City, they shipped six goals. "Palace must move the ball quicker than on Monday. They created too few clear-cut chances. Home form is a worry with three wins in 11 league games. Newcastle are also unbeaten in 11 against them. "But Palace's desire will be key. Do enough Newcastle players really want to succeed for them?" Limited game time at Paris St-Germain meant Alan Pardew made an enquiry to see if Yohan Cabaye, who used to play for him at Newcastle, fancied a reunion in the capital. Yes was the answer, as the Frenchman became Crystal Palace's record signing at £10m. The midfielder has netted four goals so far and will be looking to add to his tally at Selhurst Park today. But will he celebrate if he scores? Alan Pardew may well smirk, he deserves to after leaving the north to head back down south. Newcastle's performances have gone the same way, while after a bright start Crystal Palace are on a run of just one win in five games at the moment. Will Newcastle be affected by reported bust-up? "I don't think there is anything wrong with training ground bust-ups every now and then and Steve McClaren will hope that the aggression on the training ground will transmit onto the pitch. "I've had many bust-ups as a player and a manager and what you are looking for is a reaction." Eagles supporters are soaring high in our BBC Sport Predictor leaderboard. Currently they are third, with Newcastle 15th in the table. Think you can help boost your team's fortunes? Just sign up and join your fellow fans in predicting the weekend's Premier League games. Bragging rights await! Newcastle suffered a heavy 3-0 defeat at home to Leicester last time out with the Toon fans showing their displeasure at the final whistle. The team got back on the training field and there were reports of angry exchanges between players and staff this week as head coach Steve McClaren was furious with the attitude of some of his senior players. The black and whites have won just twice in the league so far so desperately need to take the three points home today. Former Magpie Yohan Cabaye plays against his old club and on-form winger Wilfried Zaha is also in the starting XI as Crystal Palace go with the same side that lost to Sunderland on Monday. Newcastle make two changes to the side that lost against Leicester last time round with Jack Colback coming in for Cheick Tiote, while Papiss Cisse gets a start up front in place of Aleksandar Mitrovic. Newcastle finished fifth in the Premier League in 2011-12, but the fans expected more. Manager Alan Pardew was hounded out of the club and he decided to join Crystal Palace. Since then, the Eagles have experienced an upturn in fortunes while the Magpies are battling to avoid relegation. 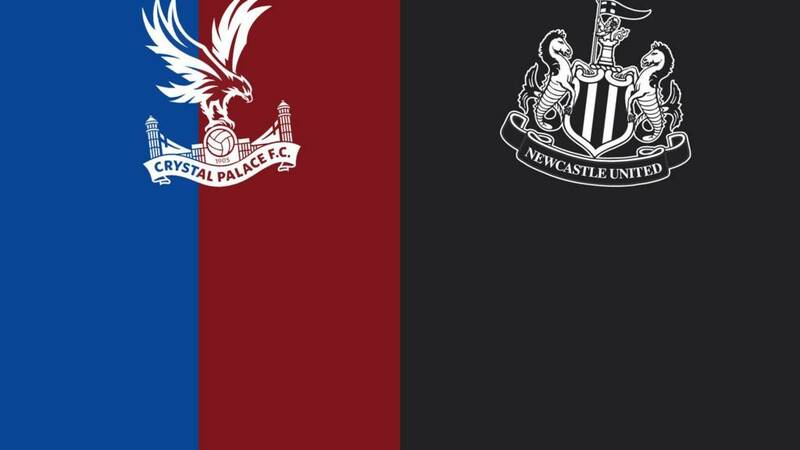 Welcome to our live page for Crystal Palace v Newcastle United. We'll have text commentary here from 14:30 GMT. You can keep up to date with all the action from today's other Premier League games here.